Between my computer, iPhone and Kindle, I’m constantly using my fingers. I know I should do more exercises to keep the cramps away, not to mention other looming problems like carpal tunnel. I found this book today. It’s by a piano teacher and he shares exercises he developed for his students. Looks like it could be really useful for all us desk jockeys, especially people like me who can’t seem to stay away from a keyboard or touchscreen. 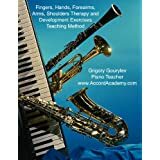 This ebook is a teaching method and is a comprehensive guide to fingers, hands, arms therapy and development. It offers illustrations of the exercises as well as links to tutorials which are designed to help you to do the exercises correctly. They are useful to any profession. Whether you are a secretary who does a lot of typing on a keyboard or you are a brain surgeon performing one of the most complex surgeries, you will find these exercises helpful because they improve agility, coordination and responsiveness of your fingers. No matter what task lies ahead it’s always nice to have finely tuned instruments (in this case hands) to do it with. Refine your body and it’ll be easier to get the results you are looking for. This entry was posted in Kindle Bargains and Freebies and tagged Books, Exercise, Free, Health, Kindle, Lifestyle by Lori Saltis. Bookmark the permalink.